Hurricane Irma: Miami's Tower Construction Cranes Pose 'Potential Danger' : The Two-Way The cranes have arms that can't be tied down and their heavy counterweights pose a potential danger. They're designed to withstand 145-mph winds — less powerful than those of Hurricane Irma. The deputy director of Miami's building department, Maurice Pons, said in a city statement that he "would not advise staying in a building next to a construction crane during a major hurricane like Irma." 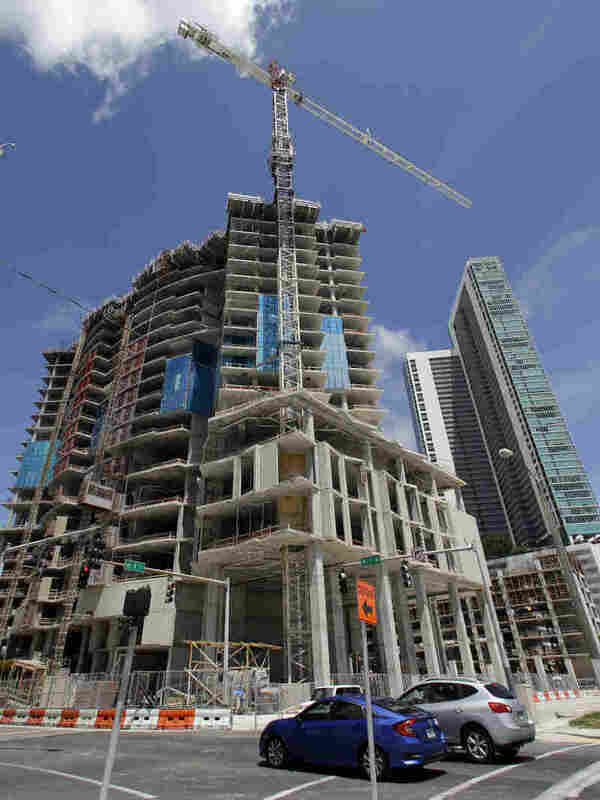 Here, a high-rise building under construction is seen Thursday in Miami. As southern Florida prepares to take a direct hit from Hurricane Irma, officials have warned people in downtown Miami to take special care because of the 20 to 25 tower construction cranes that loom over the area, hundreds of feet tall. The tower cranes are "designed to withstand winds up to 145 miles per hour, not a Category 5 Hurricane," the city said in a news release this week. Irma is now a Category 4 storm, but it's bringing maximum sustained winds of 150 mph — and gusts of more than 180 mph — as it churns toward Florida's coast. As member station WLRN reports from Miami, "City Manager Daniel Alfonso says officials knew Irma could be a serious threat with about a week's notice, and that wasn't enough time to take all the cranes down." The issue, Alfonso said, is that the cranes take time to be dismantled, and the process also calls for blocking traffic on city streets. "It takes five to six days per crane, and they can be up to 900 feet tall and include 10,000-pound counterweights," WLRN reports. Those counterweights could pose a grave threat if any of the cranes are unable to withstand wind and flying debris. As the city of Miami said in its news release about the risk, "The crane's arm has to remain loose; it is not tied down. The arm's counterbalance is very heavy and poses a potential danger if the crane collapses." Irma is forecast to make landfall in southern Florida early Sunday and pass west of Miami, with sustained winds at or above 145 mph; its hurricane-force winds extend up to 70 miles from its center. The deputy director of Miami's building department, Maurice Pons, said in the city's statement that he "would not advise staying in a building next to a construction crane during a major hurricane like Irma." When considering the risks of high-speed winds, it's important to remember that their power and potential for damage grow exponentially. Comparing a storm with the lightest hurricane winds of 74 mph to a hurricane with 148-mph winds, the National Oceanic and Atmospheric Administration says, "The 148 mph hurricane (a category 4 on the Saffir-Simpson Scale) may produce — on average — up to 250 times the damage of a minimal category 1 hurricane." Reporting on the dangers posed by Irma's powerful winds when they reach Florida, NPR's David Schaper spoke to Northwestern University civil engineering professor Joseph Schofer. David asked Schofer how safe high-rise buildings might be from Irma. "Tall structures are not particularly vulnerable except for damage from flying objects," Schofer said, "and fairly large objects will be boosted into the air with wind speeds like this."